The insidious forces of chaos still have me firmly in their grasp. I was planning to do a mhorrigoti-themed marine next but after the grittyness of Nurgle and Mhorrigot I felt the need to paint something slick. This truescale Emperors Children has been sitting half finished on my workbench for far too long so I finished the detailing and then started painting. the body only has a chaos black spray at the moment. I like his twisted, noseless head... very creepy! 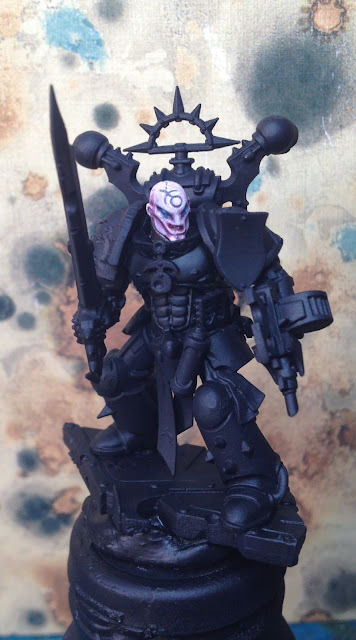 His face is excellent, creepy and perverse, just like anything from Slaanesh should be! I have not really seen anyone use the Sanguinary Guard bodies for Emperors Children, but think it is a fantastic idea, something I am surprised more have not thought of. Really emphasizes their narcissistic tenancies. I look forward to seeing some more pictures of him! Now that you mention it I haven't seen many sanginuary guard/slaaneshii conversions either. Strange - almost seems like a no-brainer.